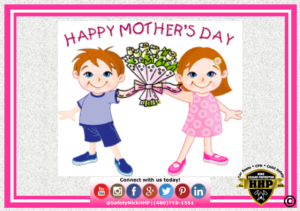 We here at Home Hazard Prevention just want to take a moment to say “Thank You!” to Mothers all over the world. And to my wife, please know that even though our daughter cannot state her intentions, we both wish you a Happy Mother’s Day. To my own Mother, thank you for being my Mom and putting up with my shenanigans for the last 3+ decades. Mom’s are great for many reasons. Maybe even some reason that they are not aware of. Think about your own life and Mom. How many times has she stayed up late to calm you down for sleep (sacrificing her own), or helped you study, or helped you feel better when your down, or been a shoulder to cry on when you fall? She has helped you and loved you more than you know. She carried you for 9 months and shared a bond that only you two can share- after all, only you have heard her heartbeat from inside her own body. Along those lines, she sacrificed her beach body, mind, and sleep all in the name of love. She cried and loved you before you were more than a zygote in her belly. She lost more sleep caring for and being scared for you and your future than you’ll ever know. At least until you have your own children. So to Moms everywhere, Happy Mother’s Day!